Welcome to The Emergence Academy! Your Law of Emergence learning resource! If you’re already a member, please login using the links above to access your programs. These ideas helped me go from nearly broke to getting my big break as an author, screenwriter, speaker and coach – making a major impact and over a million dollars in income. More importantly, they helped me make a connection to the Source of All Good within me – giving me a security the work can never take away. YOU can have these kinds of insights, outcomes, and breakthrough and take your life and work to the next level. You just need to understand the principles — which I teach you in this FREE course. It has taken me two decades and tens of thousands of dollars to understand these ideas. Enter your email to the right to get started now. Several thousand people have already experienced this ecourse and emailed RAVING reviews about how it’s changed their lives. These ancient principles helped me become a best-selling author, build a thriving coaching practice, get flown first class around Europe to speak, book consulting deals with Fortune 500 companies and writing deals with major movie studios. They helped me heal deep relationship wounds in my family, transform myself physically, buy million-dollar homes, luxury cars, take multiple vacations a year, and manifest a solid six-figure income year after year. And do it all with a deeper connection to my spirit than ever before. In this FREE training course, you’ll discover the true nature of your consciousness and how to access its full power to transform anything in your life. Tap you more deeply into your Source so you can access everything you need to succeed — because it’s already in you! Show you how to use your crises as ‘evolutionary catalysts’ — so that every problem becomes a platform for a quantum leap in your life. Best of all this course is FREE and does not sell anything. Take your power back and end the struggle of self-improvement. And take your life to the next level. I’ll show you how. Thousands of people have already begun living on The Emerging Edge. Whether you’re a teacher, speaker, writer, performer, artist, or entrepreneur, you can activate the Law of Emergence in every area of your life — and actualize more potential than you ever thought possible. Enter your email to the right and get INSTANT access. 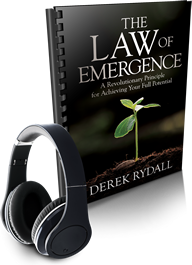 Enter your email for my FREE High Content 7-Part Audio/eCourse on The Law of Emergence and learn how to activate it in your life and work NOW.